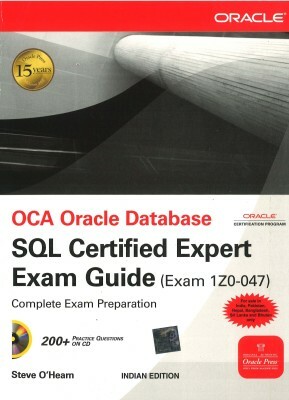 Steve O’Hearn’s Oca Oracle Db Sql Certified Exam 1Z0-047 1st Edition is a comprehensive book for certification exams candidates. The book comprises of real-world examples and practice questions for students. In addition, there are chapter summaries that help the students in understanding various topics better. This book is essential for candidates applying for certification exams and other competitive exams as well. About Steve O’Hearn Steve O’Hearn is an author and an Oracle certified application developer. He has authored the books, Oracle OCP Developer PL/SQL Program Units Exam Guide and OCA Oracle Database SQL Certified Expert Exam Guide. Hearn has designed databases for the U.S army and navy.